What color do you want your gear? 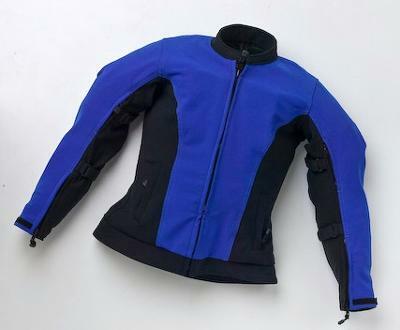 It's simple: if you could pick any color motorcycle jacket, what would it be? I'm looking for the color that most women want, because that will be the next available color for jacket that I designed. My family's company, Cycleport, has been manufacturing Kevlar-blended motorcycle gear in San Diego for over 15 years. As a rider myself, I wasn't completely happy with the fit of one of our men's jackets that I had custom tailored to fit me. So, out of the growing demand for a better fitting jacket, I created our first women's jacket (and more are on the way). It is already available in black, grey, blue, red, and hi-visibility yellow. Now, I am given the opportunity to offer it in another color. I'm putting a vote in for purple! Comments for What color do you want your gear? Wow. I live in San Diego and will now check out your company. WHITE - Safe, comfortable, highly reflective & of course, very, very stylish. I do believe good design can be safe and functional. I love lime green, not the safety neon green, but bright, fun lime green. I would love to see something is a nice bright sage green and black. NO MORE PINK!!!! Orange but not that orange! Can you do tangerine orange instead of the bright prison jumpsuit orange with white reflective piping? I like orange but can't stand the jumpsuit orange I have found in most catalogues. Highly reflective white, (no stupid cartoon graphics of skulls, flowers, butterflies or anything else, please). High quality material, lots of ventilation, and comfortable body armor are important. I have the Lena jacket from Fieldsheer and it meets most of my requirements. I would love to see a High Vis orange/white in this jacket. Reflective piping would be great as well. Red, white and gun metal. I agree....no roses, hearts, etc. Love red,white and gun metal. Not a fan of pink and purple. I buy White Jackets and would like to have white riding pants. White! Very visible, with Hi Viz trim. Love things in red and black. If you're going for designs--please not too much hearts and butterflies. How about some dragons? Turquoise would be distinctive and visible, but purple is nice too. I am crazy for Cobalt Blue. My gear would have to be cobalt blue if I could choose. I have found that it is a hard much in my color so I end up getting black. Don't know why, my bike is white so I guess that should be my color of choice. Red is always good. I'm certainly on board with the comments requesting purple. How about aqua or turquoise with black? Thinking about painting my bike aqua and black this Winter. One other comment: No butterflies or hearts or roses. I know some women love those motifs, but not all of us! Offer some alternatives. We make pants too, and they can be made in any color that we have available for our jackets. Grey is a pretty common choice. Hi-Viz!!! And in really large sizes!! Teal with high visibility piping! I'm tired of the same old colors! How about baby blue. Anything BUT pink, which is overdone. Pink is my absolute favorite color! Sorry ~ saw the color after I first commented, but how about colors for the pants? I would like to wear a protective pant in warmer weather, but not black. Road work way lime green or yellow ~ however you want to describe the color ~ VISIBLE, VISIBLE. Purple would be good. I also like stone or sand. But in the name of visibility, with the "good" purples being very dark, purple w/white or w/reflective piping??? ?